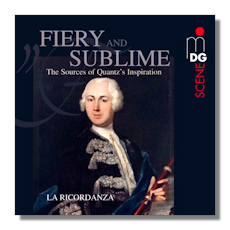 Part of the booklet title reads "The Sources of Quantz's inspiration", an apt introduction indeed, as this CD is not only about Johann Joachim Quantz's music but also includes works by some of his most distinguished contemporaries. Born in 1697, this German composer was to some extent a man before his time. During a period of continuous belligerency between many small ducal states, Quantz's ideal was that of introducing a multinational musical style in an age when musicians were treated as servants and labourers, and whose salary was a travesty of human justice. Best known as a flute teacher of Frederick the Great, the composer's formative years were made in Dresden and during a 3-year tour on the continent, visiting France, Italy, England and Holland between 1724 and 1727 and during which he was able to assimilate the different continental styles of flute playing and composing. This issue explores this vast array of riches by presenting two representative pieces of Quantz himself, and four other works by composers that he met during his Grand Tour. The creations by C.P.E. Bach, Leclair and Graun are all extremely well crafted and full of delicate writing brimming with excellent tunes. The Blavet piece is maybe the most impressive and together with Quantz's two compositions forms the core of this quite superb disc, presented and recorded in the finest MD&G tradition. La Ricordanza [Brian Berryman (flute); Annette Berryman (recorder); Barbara Hofmann, Katharina Huche, Christoph Heidemann (violins); Bettina Jhrig (viola); Dorothée Palm (cello); Zvi Meniker (harpsichord)] performs with polish and panache and their interpretations are once again splendidly executed with great attention to detail and wistful virtuosity. This is a warm and generously filled programme that delights from start to finish. Copyright © 2010, Gerald Fenech.